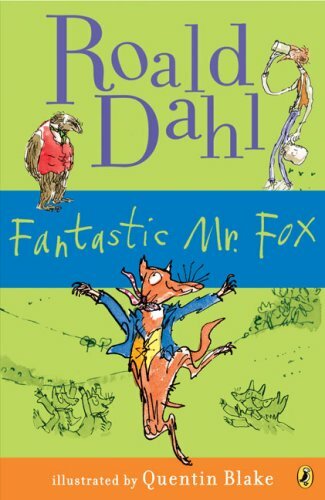 This past week, I decided to pull Fantastic Mr. Fox by Roald Dahl off my book shelf to read to my 3 year old. Fantastic Mr. Fox is one of my favorite Roald Dahl books (#2 favorite by Dahl in fact). And didn't know how it my three-year old daughter would handle the book, in terms of it being a chapter book and us working through it - but she absolutely loved it. I'm not sure how appropriate it is for a three year old, but I just made some modifications to the text as I read (some times I changed the word "kill" to "hurt" for example, or "Shut up, Badger" to "Please be quiet, Badger"). But the book translated to bed time/nap reading perfectly with it's 19 very short chapters we would read two or three at a time (although she always begged for more), and every page had a picture of some sort to help the story translate for her and keep her engaged. And her favorite part was talking about the "Smelly Farmers." My favorite part was when she would told me tonight we finished it she wanted to read it again and more books like it. Now I just need to figure out what other chapter books we would enjoy reading together (ideally short chapters, good story, and pictures).